Electric countertop burners are very handy appliances which will allow you to cook in more situations than a regular stove can. Whether you are redecorating your kitchen, going travelling, having an outdoor dinner party or just need an extra cooking zone – purchasing an electric burner is a great solution. We have searched for the best electric burners and given our reasons why we think the products below deserve to be in our top picks. This guide will help you to understand what features and factors to look out for when choosing your own electric burner. 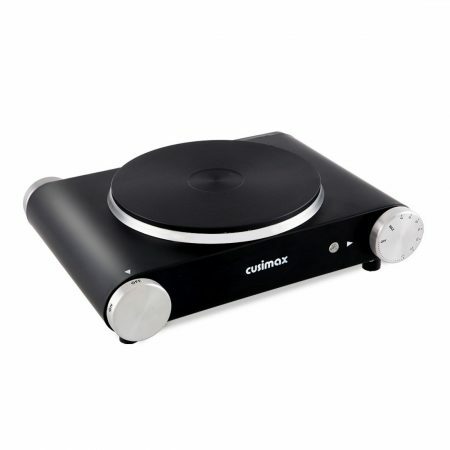 If you are just looking for a quick recommendation we highly recommend the Cusimax electric burner. You can use any cookware with it and it also heats up fast, which is great for a smaller burner. You can find a link to this electric burner here, which will take you to the product on Amazon. Knowing what to look for in an electric burner is important as you want to make sure it will be able to efficiently heat and cook your food. It’s also important to ensure it’s easy to maintain and use with decent power and temperature settings. When looking for an electric burner keep in mind that you’ll need to clean it after each use to keep it in top condition and get the most out of the appliance. Just make sure you let it cool down first! Electric burners that have the plates sealed to the appliance make this much easier. Any extra mess can be wiped away with a damp cloth or sponge without damaging the burner. It is important to look out for electric burners that have multiple temperature settings as this allows you to have much more control when cooking. You’ll be able to cook a wider range of food with this option. Making sure the cord length is at a reasonable length is important. You don’t want to be restricted when using this appliance since it can burn you quite badly if you’re not careful. Since it’s plugged into the nearest electrical outlet you want to make sure your working space is as safe as possible. Electric burners can be used as an everyday cooktop burner or a special occasion extra cooking zone. Warranty is an important thing to look out for before buying your own electric burner. As with all electric appliances sometimes they can become faulty and won’t function anymore, this can occur anytime after purchasing the product. This can be a very frustrating time if your product didn’t come with a manufacturer’s warranty. Before purchasing one of these electric burners, think about how much it’s going to set you back if it did stop working suddenly without a warranty. 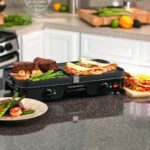 This Cuisinart cast-iron double burner provides a powerful even heat that includes 6 separate heat settings for each plate, to give you complete control of your cooking and heating. The unit is easy to clean with a damp sponge, or paper towel, and the plates are sealed so you don’t need to worry about any residue getting inside the appliance. The larger plate has a power of 1300 watts with the smaller one at 500 watts. This will let you boil water with ease and allow you to cook all the things you would normally on a built-in stove at home. 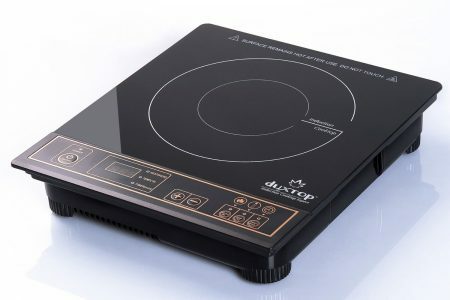 If you are looking for an electric burner to use as your primary cooktop, or would like one to accompany your built-in stove this would be the perfect choice. 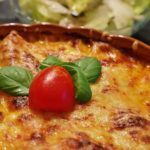 It comes with many great features which make it a great addition to any kitchen, however it does take awhile to heat up and cool down so make sure you prepare in advance. We highly recommend this electric burner as you can expect fantastic results at a reasonable price for what it offers. You can also check out the single burner version by clicking this link to Amazon. The Secura induction cooktop burner is a powerful burner that will heat water and all types of food fast and evenly. 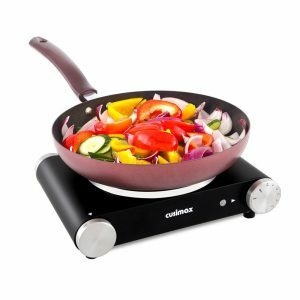 It comes with many great features but you can only use this burner with certain cookware like the Duxtop cookware. With 10 power levels 200-1800 watts and temperatures from 140-460°F you can be certain there is a setting perfect for anything you want to cook. Being small, lightweight and compact makes it perfect for taking with you while travelling. It includes auto-pan detection which will automatically shut off the unit if no pan is detected after 60 seconds. If you’re looking for a high quality electric burner for a good price to use at home in the kitchen or take with you travelling, then this is a great choice. It’s effortless to clean and looks sleek and modern as a centerpiece when used on a table or for outdoor parties and works great as an extra cooking zone in the kitchen. The Cusimax electric burner is great for an extra cooking zone in a kitchen, holiday homes, camping. It’s a cinch to use, easy to clean, includes an auto safety shut off feature and a stainless steel body which will last for many uses and is built to last. You can cook a wide range of food items on this electric burner and can boil water easily. It comes with an 18 month warranty and works with all types of cookware which is a nice addition. 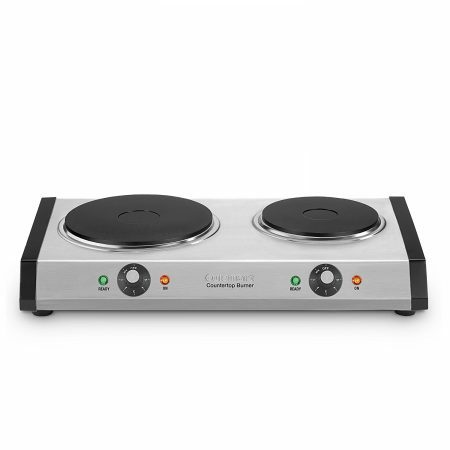 If you are looking for something that’s cheaper than most electric burners but will still get the job done as the more expensive types and brands this is the one for you. It has a nice modern look to it which will add a bit of style to any kitchen, it’s small and compact which makes taking it to another destination easy. Just be aware that the whole unit gets very hot to the touch so if you have children keep the unit pushed as far back on the countertop before use. 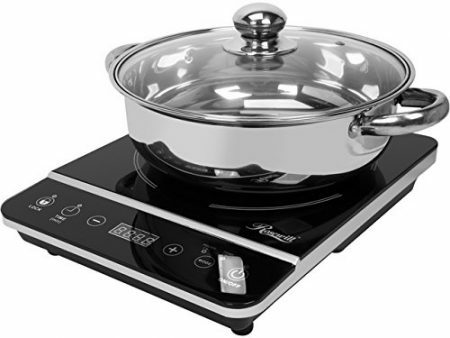 This Rosewill induction cooktop will heat your food fast and efficiently with 1800 watts of power and its 8 different power and temperature settings. With its modern touch screen digital display you can have complete control over your cooking settings. 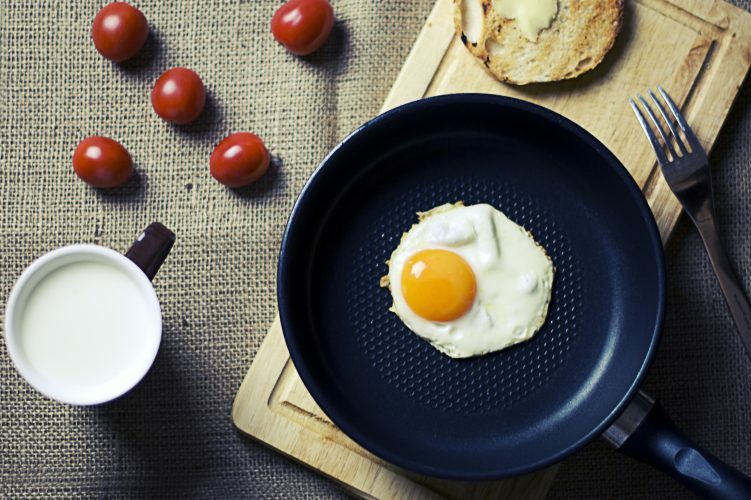 Induction cooktops are energy-efficient and your cookware heats up much faster than regular cookware. It also features a 3 hour timer setting, the sleek look of the polished crystal plate makes it a nice centerpiece on any table whilst cooking. If you are looking for a modern, energy-efficient and powerful electric burner the Rosewill induction is a great choice. It’s very affordable for what if offers and is very easy to clean, with its small size it can also be easily tucked away till the next use. We hope you’ve enjoyed reading through our guide to choosing the best electric burner for you. Most people might assume electric burners are just for people who have no built-in stove. 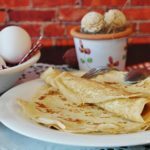 However they actually have many uses as they are easily capable of being used as someone’s main stove, for use while the kitchen is being redecorated, outside dinner parties, camping trips and many more. This is a great appliance to own and we hope you have been able to choose one suitable for your cooking needs. If for any reason you didn’t find something that suited you, we recommend for you to check out Amazon’s bestseller list for more options.